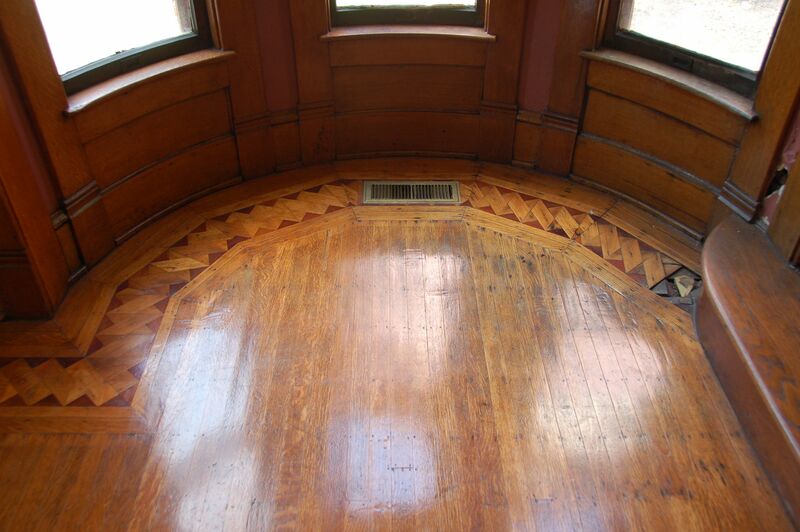 Originally, the 1894 Cross House had cheap pine floors on its first and second levels. This was because these floors were covered by the extraordinary luxury of wall-to-wall carpeting (27-inch wide strips hand-sewn together). Later, the pine floors were covered with plain oak floors. If I were rich I would not hesitate to tear out the plain oak floors and at long last install gorgeous floors with parquet borders. As things stand however, I must make do with what I have. Most of the oak floors are in relatively good shape. Save the library. This room had two bathrooms later inserted into it (since removed) and a closet (also removed). There was termite damage, too. Justin C, the floor master, said he could repair all the damage, and this would cost like twice the money than if he just wholly tore up the floor and replaced it. 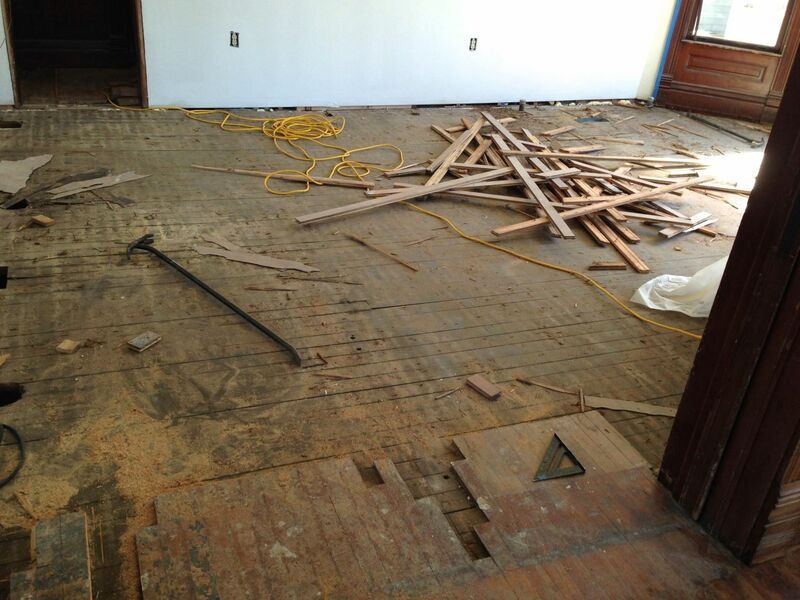 This option had a big dividend: the torn-up flooring would be a perfect match to repair all the other floors in the house. Gone floor. 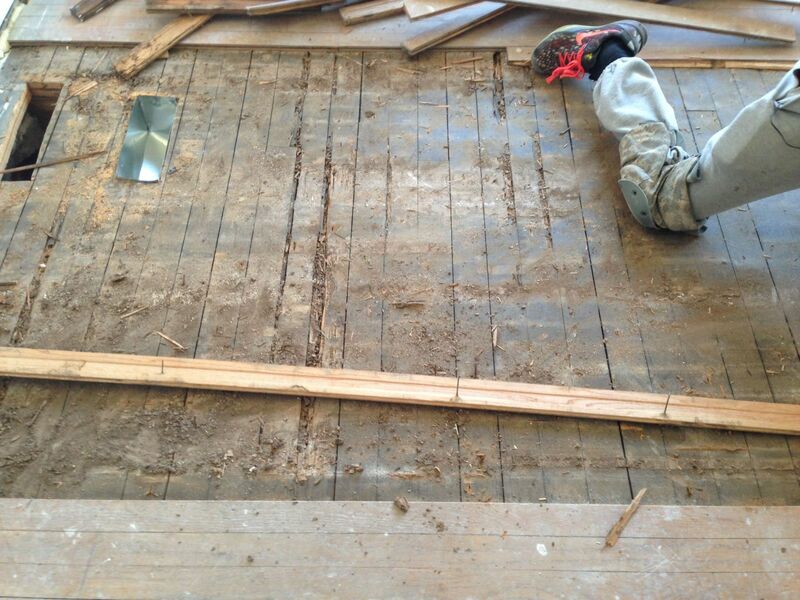 What is so cool is that under the oak flooring is the original plain pine flooring. And nobody has seen, nor walked on, this flooring for many many decades. .Separate from the visible termite damage to the oak flooring was this UNSEEN termite damage to the 1894 pine flooring. S C A R Y. I am glad to report however that the previous owner, Bob Rodak, did a lot of termite prevention, and we have not found a termite in the house. Yet. 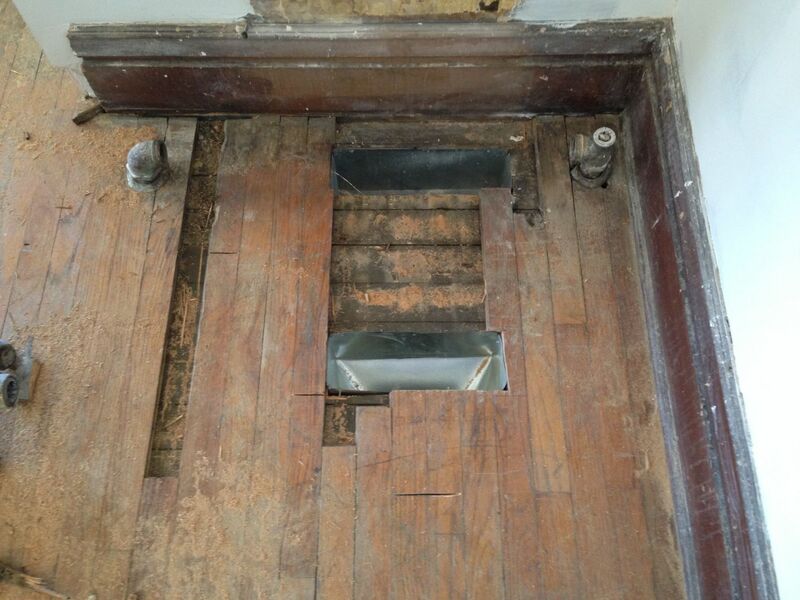 When the oak flooring was laid down, it was simply notched (none too well) around the legs of each radiator. Well, there is a limit to what I must tolerate! So, I am having proper wood installed under every damn radiator leg in the house, after having (sigh again) each radiator lifted by 3/4-inch. In the image above you see two ducts to the A/C. The one at the top was under the radiator, and this impeded the all-important air flow. And I do love good air flow. So I had the duct relocated (bottom). The salvaged flooring from the library will repair all this. If all goes well, the library and living room flooring will be sanded and varnished…soon. April? I am crossing my fingers. It’s equal parts exciting and terrifying. We haven’t decided. You have inlay?????????? I am SO jealous! 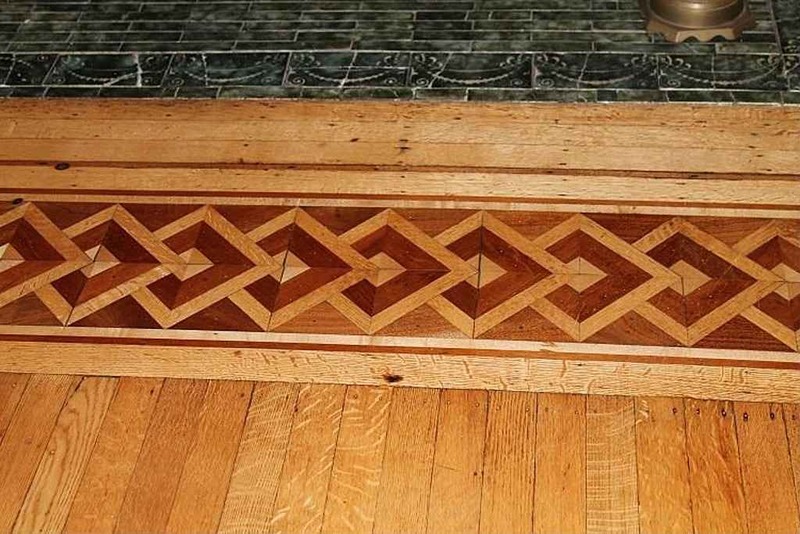 We have inlay in the Entrance Hall, but not in the Parlor, where the floor damage is. But we’re thinking about adding it there, since we have to rip up the edges anyway…. OMG! Soooooooooo beautiful! Yep, it is confirmed: I am jealous! A straight border like mine might be pretty doable… and the darker bands would hide the transition to wood that’s not a perfect match. If Doug tries to inlay any kind of a pattern in he’s definitely nuts. And this might be a terrible idea but I’m gonna float it anyway. My parents have a neighbor who’s a very high end builder, and he told me that I should rip out and replace all my 1930’s 5/16″ face nailed living room flooring because it’s not worth the trouble to reset the nails, and that there are staining techniques to fake the look of the border so you’d never know. Apparently that’s how he does it for people who are way fancier than we are. I was going to ignore his advice and punch down all the nails in my floor. I can ask if he has photos of whatever he does for a border. But I can see the floorboards in mine and they’re mitered at the corners and it’s great and I don’t really believe him when he says that it looks the same. Our bathroom was built with old-growth pine strip flooring, and badly rotted around the toilet. We redid it with tile, but carefully salvaged the good flooring, which was invaluable for patching in the kitchen and other upstairs rooms. Our hardwood guy said matching red oak (what our house has in the fancier rooms) is easy with modern wood, but softwood is all but impossible. He was right: the areas of oak he patched with new are indistinguishable from the original, but even the pine areas that were patched with the salvaged wood are somewhat noticeable, as they darkened and stained differently in different rooms, which still shows up even after a full resanding. 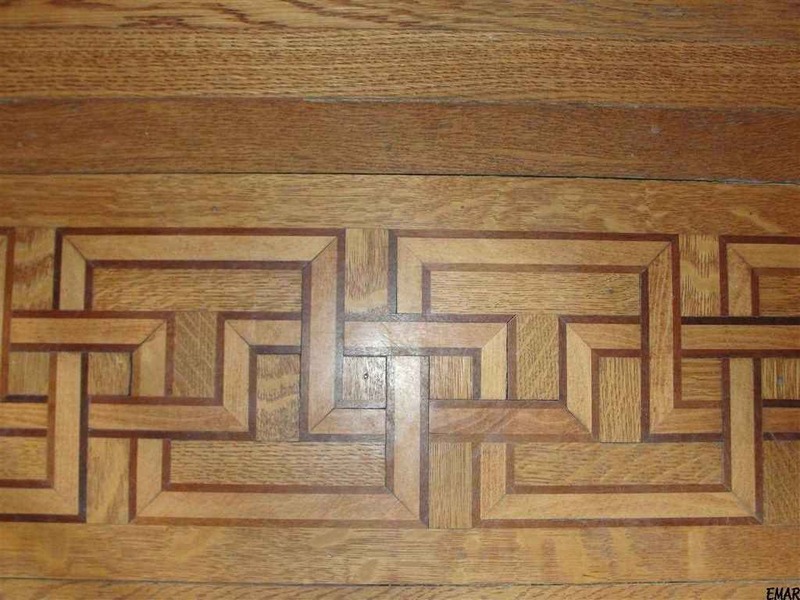 The crazy ambitious part of me wants to do some inlay on a future house (it wouldn’t fit the style of our current one). Since the original inlays were factory-produced, doing it well by hand would require a lot of jigs and carefully setup. The operative word is crazy!